Hope all of you are staying toasty & safe during the snowy weather this week! Here are a few more useful resources for coping with severe weather. http://www.seattle.gov/ Press releases & up-to-date information from the City of Seattle. http://takewinterbystorm.org/ Winter weather preparedness tips, checklists & many other resources. http://www.rpin.org RPIN, Regional Public Information Network – road conditions and alerts from other communities in our region, as well as from Seattle. http://westseattleblog.com/ Most of you already know about the West Seattle Blog… but here’s where we look for local up-to-date information about weather-related impacts. 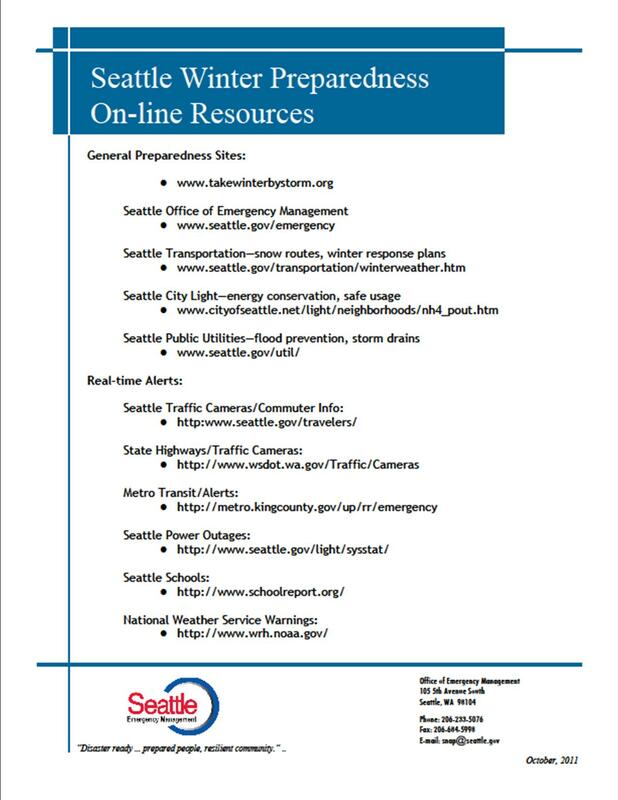 Lastly, the following flyer from the Seattle Office of Emergency Management has additional resources. Click here, Real-time Alerts and Web Resources (.pdf format ), for a .pdf version that has active links and is better for printing. This entry was posted in Announcements and tagged Seattle Office of Emergency Management, severe weather resources, West Seattle emergency preparedness. Bookmark the permalink.